Next you can build a miniature tree house . . .
Oh my goodness, those are beautiful. Heh, I was picturing little birdhouses at first! 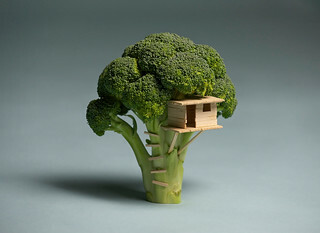 What about the Broccoli House? Are these little guys strictly indoor trees? Mine seems to be happy out on the deck on the glass-top table. The papers that came with it indicate that they are plenty tough enough to take it. I plan to find some of those little green b-b size fertilizer balls to keep it feeling good. I also plan to bring it into the house whenever a freeze is coming regardless of what the instructions say!